When graduating from college, the last thing a student is thinking about is student loan repayment. But in six short months, the first student loan payment will be due, and some students do not know how they will repay them. Having a plan for repaying can make the process much easier. Over the course of four years in college, you may have borrowed federal subsidized loans, federal unsubsidized loans and even private loans. There are new loans every semester, by graduation you could have a hefty debt amongst multiple lenders. It can be confusing and overwhelming to figure it all out. You need to create a list of all the lenders you are with, how much you owe, and when the payment is due. In order to create a good repayment plan, you can't be in denial about how much you owe, knowing as much information as you can puts you in a position of power. Consolidating your student loans transforms multiple loans into one single monthly payment. This is a great option if you can get a better interest rate than you received at the time of disbursement. This can cut your payment greatly and make the loans more affordable. It also makes it easier to remember when the payment is due. If you are just finding employment or have not yet found a job, you may not be able to afford your student loans. Calling the lender can be a great help. They can extend the grace period so the payments are pushed back. Also, there are multiple repayment options. You can choose to repay based on income. If you are just starting out and your income is low, this could be a great option. As your income increases, so does your payment. The lender will have you complete a quick application to apply for any special assistance programs. Student loans at a low interest rate are not a bad debt to have. It does not affect your credit score as long as you pay on time. So paying off your loans early is not necessary. But if you are lucky enough to have a good, steady income, this may be an option you are interested in. Being rid of debt has a feeling of security. Look at your income and see how much you can afford. Do not change your monthly payments with the lender, in case your income changes, you don't want to be left unable to afford your payment. Instead, just add to each monthly payment. Be sure to make a note that you want any extra applied to the principle only. If you don't have much discretionary income, you may want to add a second job. 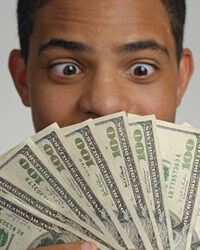 Also, applying extra income, such as a tax refund, could reduce your student loan debt rapidly.